St Just is the most westerly town in England. Originally a collection of sparsely-populated farming hamlets, the town expanded in the nineteenth century to accommodate the mining industry, of which it was an important centre. 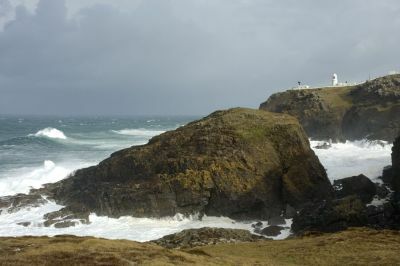 Most of the mines in the St Just area were located on the coast and owing to the area's unique geology were at the cutting-edge of world-famous pioneer submarine mining technology. 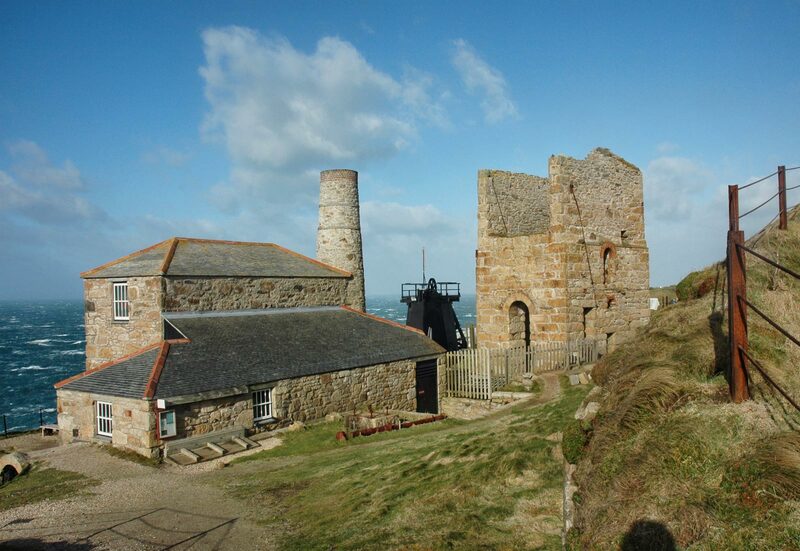 The St Just Area Regeneration Project was completed in 2005, ensuring the survival of more than seventy industrial sites including two thousand shafts, thirteen engine houses and two of Cornwall's best-known mines, Botallack and Levant, almost all of which are located on the coast. 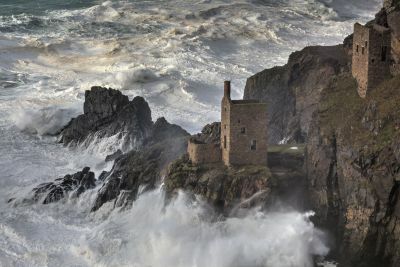 Today, ruined mine buildings, legends of hardship and disasters, remote rocky coves, wrecks, rare birds and seal pups define this wild and windswept territory. Sandy beaches are few and far between on this stretch of coast. 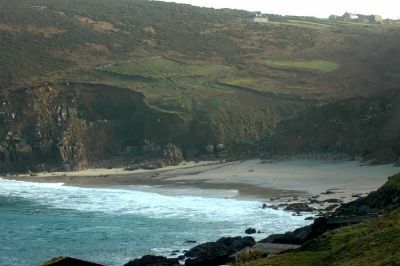 Portheras, near the village of Morvah, is an exception. Located on a remote section of the coast path and with no facilities, the beach is surrounded by sheer cliffs and somewhat hard to find, which only adds to its charm. 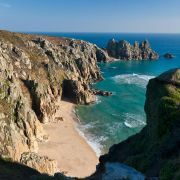 Owned by the Duchy of Cornwall, Portheras was unsafe until recently, due to razor-sharp remains of the forty-year-old wreck of a four hundred and fifty tonne cargo ship, buried just under the sand. 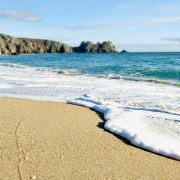 This was finally cleared in 2004 and since then the white sandy beach has enjoyed a resurgance in popularity among locals. The beach is not the safest place for swimming as a steep shelf causes a dangerous undertow at high tide and big swells tend to batter this part of the coast almost constantly. On the right day, however, it can be paradisical, while the heavy shorebreak is popular with local bodyboarders. The nearest parking places are in Rose Valley (follow the lane from Morvah to the coast) or at Pendeen Watch. Both require a fifteen minute walk to reach the beach. Dogs are welcome all year round. A minor diversion from the path between Portheras and Pendeen Watch will bring you to Boat Cove, a tiny working fishing cove of coarse sand and pebbles tucked into an inlet. 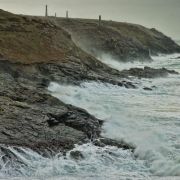 Look out for the fishermen's sheds and tiny slipway from which boats have been launched into rough seas for centuries. 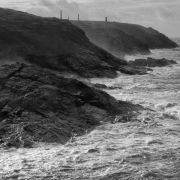 Pendeen Watch is a slate promontory on which rests the most westerly lighthouse in Britain. This part of the St Just coast is renowned for shipwrecks, with numerous sunken rocks and reefs just offshore. Building a lighthouse here, however, was no easy task. The cap of the Point had to be removed, the whole headland flattened and a huge retaining wall built on the seaward side before work could start in 1900. The original oil-fired lamp, later replaced with an electric one, is on display at the Trinity House Lighthouse Centre in Penzance. The apparatus containing the lenses, which floats around the lamp itself, weighs a cool two and a half tonnes, and floats in a trough containing nearly a tonne of mercury. The Lighthouse, whose tower consists of two rooms, one above the other, is open to visitors in the afternoon. The lighthouse was automated in 1995 and the original lighthouse keepers' cottages are now used as holiday lets. 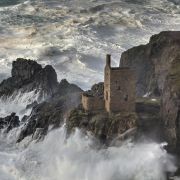 Of all the famous Cornish mine buildings, perhaps the most-photographed are The Crowns Engine Houses at Botallack, about a mile west along the coast path from Pendeen Watch. Perched in a spectacularly exposed location at the base of a very steep cliff, with huge granite walls dropping right down into the sea, it is impossible not to marvel at the sheer feat of engineering simply building these mines must have represented, never mind the practical difficulty of actually working them. 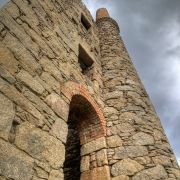 Accessible by means of a short, steep detour from the coast path, the engine houses sit almost vertically below the Count House, a National Trust property with a workshop housing a fascinating film and phtography exhibition about the St Just mining landscape. Numerous other restored mine buildings dot the cliffs here at Botallack, including an extensive network of tunnels formerly used to trap arsenic. Arsenic, a deadly poison that would have been collected by women and children, was a lucrative by-product of the tin and copper mining industries, used by American cotton farmers to kill a migrant beetle that at the time was threatening to destroy the cotton industry.